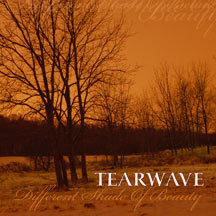 A year after their debut, Tearwave returns with this monumental 17 song, 77 minute CD. Overflowing with passion and emotion, Jennifer’s soaring vocals float over guitar glaciers, letting her words flow from a very authentic place, tapping into the darkest sides of her self. Different Shade of Beauty‘s huge washes of shoegazer / indie-rock / dream-pop is driven by Doug’s sweeping, gauzy guitars creating a dense musical interplay with Joe’s surging bass-lines and John’s insistent drum rhythms. And yet, even with the beautiful layers of musical melody, it’s the ghostly ethereal soprano and dark lyrics which beckons through the tracks, like a woman lost in a wintry, foggy forest. Much like their hometown of Buffalo, NY, these dreamy melodies can be piercingly cold at times; the beauty serves as a entrance to Jenn’s lyrics which unflinchingly explore her deepest sorrows and regrets. “Shattered Fairytale” discovers the lies in life and explores thoughts of children that are never to be. “The Message ” deals with suicide and false idols. “Reflection” touches upon a person’s horrible self image that is in their own mind, yet effects their daily existance. And having a profound emotional effect for very different reasons, “Love Only Makes Me Weak” reflects upon the losing feeling of giving in and letting somebody have your heart. Tearwave blends dark waves of disintegration with shoegaze dream pop setting a mood for self-discovery. Having the listener sit back and really feel was Tearwave’s main goal. Creating a shoegaze classic is what they have achieved.